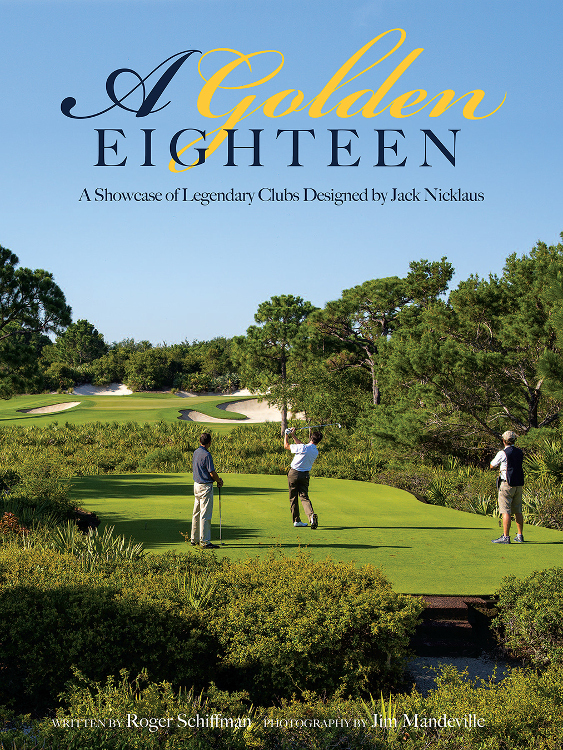 A limited number of copies remain of the first printing of A Golden 18—A Showcase of Legendary Clubs Designed by Jack Nicklaus, published by the Legendary Publishing Group. Released in June and already having sold through nearly 4,000 copies, the beautiful, oversized coffee-table book highlights 18 premier Jack Nicklaus-designed courses spread across the United States. To preview the book, click here. The book is a literary and photo celebration of the clubs and communities that have achieved remarkable success due to myriad reasons, not the least of which was the impact of its centerpiece amenity—a golf course involving the design brilliance of Nicklaus. A Golden 18 ties in the unique life and lifestyle that surrounds these Nicklaus courses, as well as the success many have enjoyed on the membership, residential or tournament side. Not only does the volume feature striking photographs and compelling words detailing Jack’s golf course designs, it dips into his life and playing career, as well as presents an examination of the clubhouses, the membership, the history, the staff, the real estate, and the lifestyle associated with these luxury venues. Never before has a book of this stature been produced that surveys these clubs in such detail. The book celebrates a wide variety of properties all across the country—from The Bear’s Club and Shoal Creek in the South, to Sebonack and Creighton Farms in the East, to Muirfield Village and Harbor Shores in the Midwest, to Sherwood and the Challenge at Manele in the West. Written by award-winning journalist and former Golf Digest Managing Editor Roger Schiffman, and photographed by long-time Nicklaus photographer Jim Mandeville, the volume promises to be an ideal holiday gift and a handsome keepsake for any member of these clubs or anyone interested in Nicklaus designs or golf history. Books are available with a custom cover specifically designed for each club for $100. This limited-edition collector’s item is not available in bookstores but rather through the clubs themselves. To place an order, visit http://www.legendarypublishinggroupllc.com/.